Booking a photographer is among the top priorities for couples looking to tie the knot these days, but 100 years ago, photographers were not so well equipped to capture candid scenes at weddings. Having a memento of the special day was still important, and so many couples took time on their special day to visit the studio of a professional photographer. One of Wellington’s foremost photographers at the turn of the twentieth century was Berry & Co., run by William Berry, and assisted by his wife and daughters. The studio’s building – located at 147 Cuba Street and still bearing the company’s name – possessed two photography studios and generous dressing rooms. Many thousands of newly-weds used these rooms to preen and adjust their wedding garb before having their photo taken. During the First World War, many such bridegrooms emerged wearing their military uniforms. When the building’s new occupants renovated the upper floor in the 1980s, they discovered a cache of images and business ephemera in the building’s ceiling space. 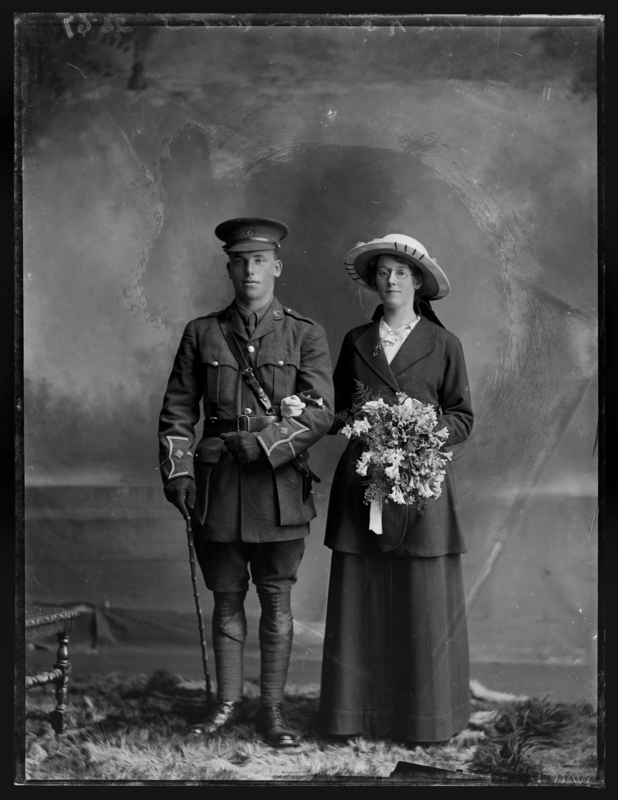 Amongst them were several glass plate negatives of newly-wed wartime couples. 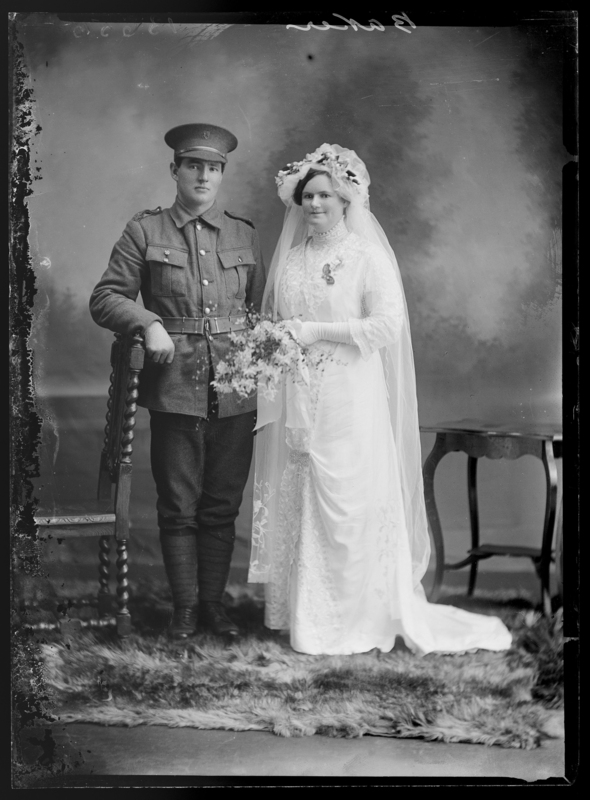 These wedding portraits – now in Te Papa’s 'Berry Boys' collection – shed light on the disruptions that the First World War made to people’s plans to marry and start new lives. 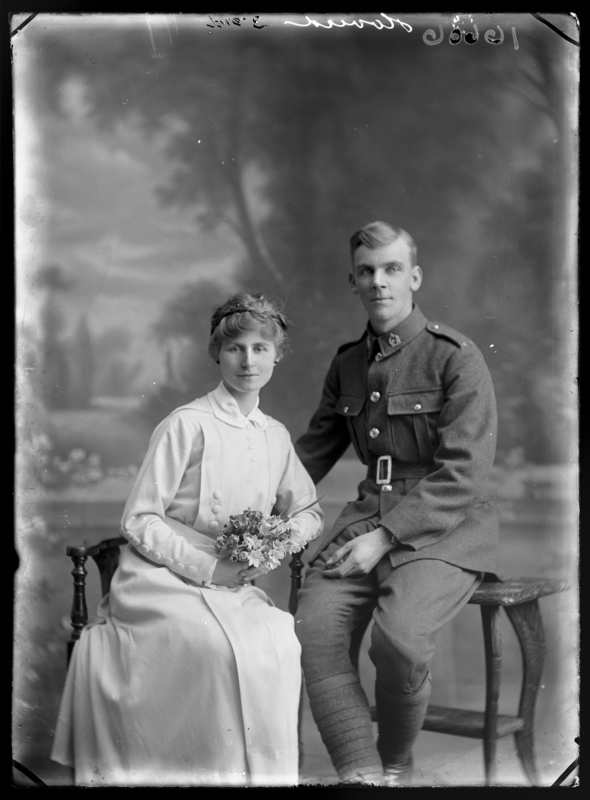 Cecil Baker had almost finished his military training when he married Hannah Harvey at the Kent Street Presbyterian Church on 22 July 1915. A few weeks later he left New Zealand with the 6th Reinforcements. 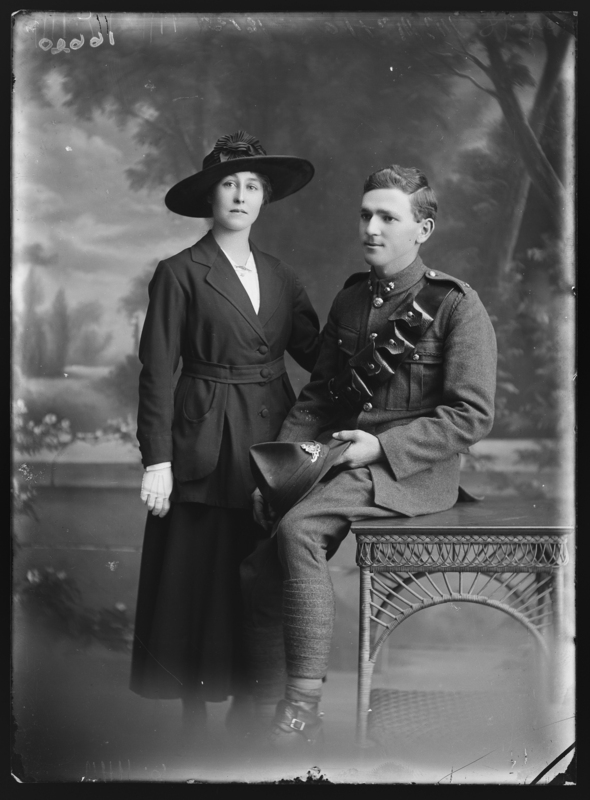 Edmund Robinson was 22 years old when he attested for service in July 1915, and married Mary Reid on 11 September that year. In a suitably wartime theme, Mary wore a blue military-style dress on her wedding day, with a ‘French hat of pale pink and blue, trimmed with roses,’ according to a report in the Dominion. With twenty months of Territorial service under his belt, John signed up for the war on 3 October 1916 at age 22. It was while training at Trentham military camp that he was granted leave to marry Maud des Forges on 15 February 1917. Maud, a 34-year-old widow, had four children from her previous marriage, and gave birth to a fifth while John was serving overseas. Alfred and Queenie met at their workplace, printer-publisher Whitcombe and Tombs, in late 1916. In June the following year, Alfred enlisted for war at the Wellington Town Hall. 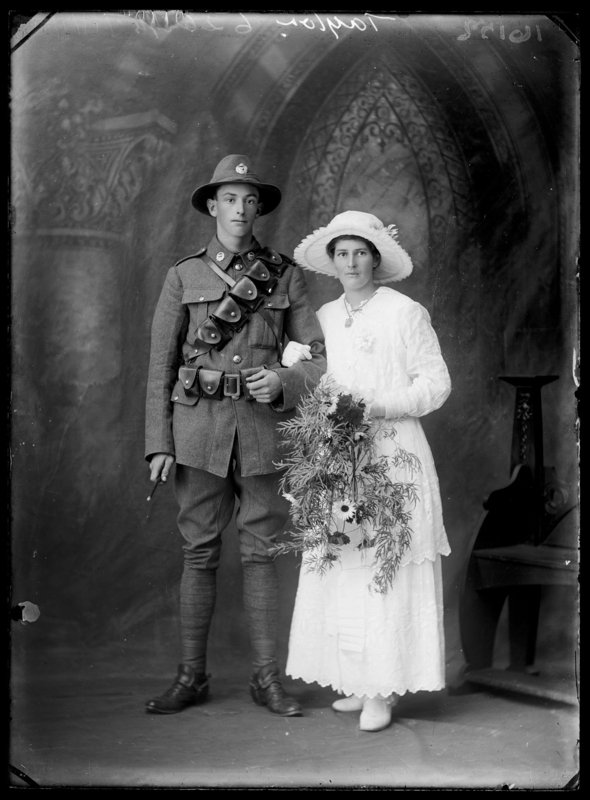 Shortly before the completion of Alfred’s training as a gunner, the couple married on 19 April 1918. James Hoverd first enlisted for the war in 1916, but due to his fast heart beat and flat feet was classified C1 – ‘likely to become fit for service overseas after special training’. He was conscripted in 1917, began training in Trentham the following year, and granted leave without pay to marry Florence Davies in Vogeltown, Wellington, on 20 July 1918. The normal tendency towards a general increase in the marriage-rate was disturbed by the war in 1914-19. Taking the years seriatim, 1914 is little affected, the influences being of a counterbalancing nature. The succeeding year, 1915, in spite of the increasing diminution in the number of males of marriageable age, established a new record in point of number marriages…. This may be regarded as resulting almost wholly from the passing of the National Registration Act in 1915, and the desire of many men to be shown in the register as married, with a view to obtaining certain advantages or escaping certain obligations. Many marriages which would ordinarily have taken place in the later years were thus celebrated in 1915. The result was to adversely affect the marriage-rate in 1916. The Military Service Act of 1916, which took into account only marriages taking place before May, 1915, had a further depressing influence. The absence, in increasing proportion, of a large part of the men of marriageable age was felt still more severely in 1917 and 1918. In 1917 the rate descended to a level never previously reached, and in 1918 reached an even lower position. While not exactly a large sample, the couples from the 'Berry Boys' collection above suggest that the varying patterns in the marriage rate might not have been as hard-nosed as described in the Year-Book. All the men had already enlisted before their wedding days, and were on the point of being sent overseas when they married. For them, tying the knot was a way to maintain a relationship or connection with home. Certainly once the war had been grinding on for a number of years, marrying one’s sweetheart was a way of securing an important link in the face of a precarious future. Discover more stories in Berry Boys: Portraits of First World War Soldiers and Families, a powerful book from Te Papa Press offering an extraordinary, evocative snapshot of New Zealanders facing the First World War.